Website of Brooklyn based artist, Walter Lynn Mosley. Paintings and drawings by Williamsburg, Brookyn, New York based artist Walter Lynn Mosley. Walter Lynn Mosley has taught watercolor painting and drawing basics at Lincoln Square Neighborhood Center for 5 years. He is an American Artists Professional League Fellow and a member of the Salmagundi Club . He has exhibited with the Allied Artists of America, the Audubon Artists (in New York City), the Greenhouse Gallery and the American Impressionists Society. 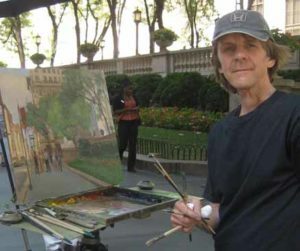 In 2012 Walter was the first artist chosen to participate in the Bryant Park Painter in Residence Program . Consequently the New York Times wrote an article which featured an interview with Walter, click here to read. Walter received the award for Narrative Excellence from the National Oil and Acrylic Painters Societ Spring 2017 On-Line International Exhibit. Subscribe for news, exhibitions and special offers.